Hello, friends! It's time for another awesome Simon Says Stamp Wednesday Challenge! This week want to see your Thanks and Thanksgiving cards! U.S. Thanksgiving is coming up, so if you live here, this is a great time to make a card for someone special. If you are outside of the U.S., it's totes cool, yo. We all need fabulous Thank You cards in our stash! The Design Team is showcasing Simon Says Stamp Exclusives today, so you are in for a TREAT! I decided to have a little fun with this one. I created my own turkey using the leaves from the Simon Says Stamp One With Nature Set and then added a fun sentiment from the Thanksgiving Table set. I used all Simon inks for this one, too. I absolutely LOVE my Simon inks! For reals. I can't wait to see your creative Thanksgiving and Thank You cards! So creative and super cute!!!!! Love your idea to make this turkey, Jennifer! Really fun! 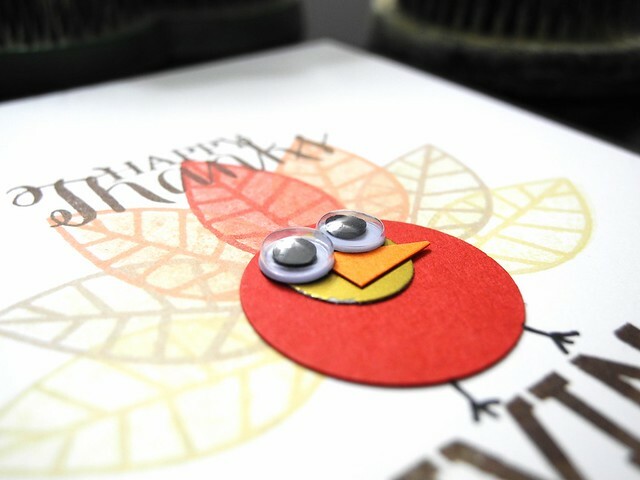 A gorgeous card Jennifer, an adorable cute Turkey with his lovely googly eyes and pretty tail feathers!! This is so stinkin' cute and clever! I love it! This turkey is so cute, really awesome idea!